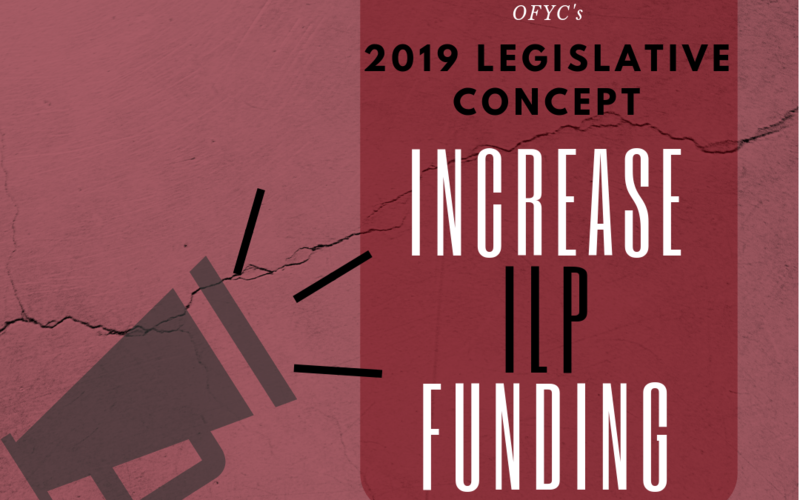 OFYC is excited to announce our 2019 Legislative Concept: Fully fund the Independent Living Program (ILP). With sufficient funding, the Independent Living Program will be able to meet the needs of transitional foster youth who are eligible for services, statewide. What is ILP? The Independent Living Program supports youth and young adults who are or were in foster care on their journey to adulthood. ILP services help youth in foster care make the transition to self-sufficiency as adults by offering academic and/or vocational education, personal and emotional support, and the opportunity to develop healthy interactions with dedicated adults. How was this decision made? Shortly after OFYC’s 2018 Policy Conference, Children First for Oregon’s Legislative Director Chris Coughlin teamed up with OFYC to present an “Advocacy 101” training for OFYC members. This training was designed to help OFYC members understand the legislative process and strategy — especially how it relates to the work members do as advocates. After completing the training, OFYC members — with the support of Lisa, Chris, and Kate — analyzed the 10 policy recommendations that were created at the Policy Conference. OFYC staff held video conference calls, group QA chats, and in-person trainings in order to ensure that youth were supported in their desire to inform themselves about the process as they decided which of their policy recommendations was best suited for legislation. It’s important to note that not all of OFYC’s policy recommendations have to be enacted through legislation — some recommendations can be implemented through other avenues, such as internal DHS policy changes. Ultimately, fully funding ILP — and, in doing so, supporting transition age youth — was selected as our legislative concept to take to the Oregon Legislature in 2019. What’s next for OFYC? OFYC members will gather in January for their Advocacy Convening in Salem, where members will develop and research the ILP concept and then meet with legislators seeking their support to pass the Bill. Members also will select a Legislative Team to make strategic decisions and serve as lead advocates as the bill moves through the legislative process. Then, if it passes, the bill will be written into law and go down in history as our ninth legislative concept to have written into law!